The latest Toolstation catalogue has dropped through my letterbox and I see they are selling a couple of Einhell petrol engined rotary lawnmowers, a 40cm push mower and a 46cm self propelled petrol mower. I wondered how the prices they were charging compared and so I had a look around at other retailers selling Einhell lawnmowers. The main problem I found was that Toolstation do not list the model numbers of the Einhell mowers they are stocking. 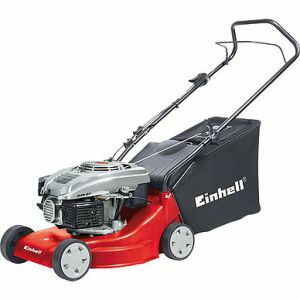 Starting with the 40cm push mower I found Machine Mart are selling the Einhell GH-PM40P petrol mower which looks to have the same specification as the Toolstation one for a lower price. Looking at Einhell 46cm self propelled mowers is not so straightforward as there are a couple of different models listed on both the websites of Machine Mart and the garden machinery specialist Mowdirect.